I think we would all agree that the purchase a quality pair of shoes is an "investment" in our feet as well as our wardrobe. And like any investment it needs protecting. Thankfully this is not a difficult task. 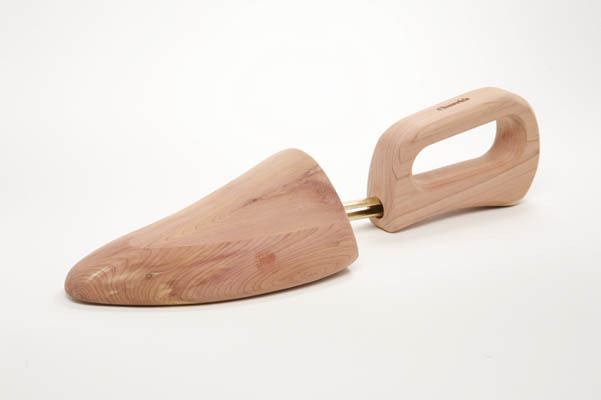 Perhaps the single most important and easiest step we can take is to insert wooden shoetrees into the shoes when they’re removed. Why? During the day our feet perspire, a natural fact. The trees draw the perspiration away from the leather lining and hold the shoes in place as they dry. If you have ever seen a pair of shoes that are cracked at the "break" there is a good chance it is due to "tree negligence". Left empty the leather contracts while drying. Once the shoes are worn again the leather must expand, over time, as this process repeats the leather begins to breakdown and crack. It is also important that the trees fit the shoes properly. If the trees are too large the shoes will be stretched out of shape and if too small they will not maximize their intended purpose. We sell trees made by the manufacturers that are "last and size specific". These are the best trees for the shoes because the shoe is put back on its last to regain its shape. If you have your own trees try and find a shape and size that is closest to the last of the shoe. Using similar trees is better than not using trees at all.